In the early 1990’s, a killer stalked New York City. This killer was no stranger to the city, but with the help of an especially savage first cousin, the killer this time eluded arrest for several years. The killer was an especially potent and multi-drug resistant tuberculosis. March 24th is World TB Day. The leading killer of persons with HIV-AIDS, tuberculosis kills 2 million people annually, mostly in the poorest nations. Even more are orphaned in the grasp of this deadly but curable disease. As the outbreak in New York demonstrated, until this disease is eradicated worldwide, more drug resistant strains will continue to surface even in industrialized nations. It is essential for Congress to fully fund the U.S. fair share of the Global Fund to Fight AIDS, TB and Malaria for 2008. I also urge Congressman Edwards and Senators Hutchison and Cornyn to sign on to the Stop TB Now Act of 2007. If fully funded, these initiatives can cut the number of TB deaths in half by 2015 and eliminate the disease by 2050. As one of the wealthiest nations on earth, we have the resources to stop this global killer. Let’s hope that our leaders also have the will to do so. Letter published recently in the Waco Tribune-Herald in conjunction with Gail's work on the Results project, an international humanitarian group. Gail is a longtime, loyal member of Waco Friends of Peace. TIME: Free pizza buffet 6p.m. 703 N. Valley Mills Drive, Waco. WHO: All welcome, seating limited, arrive early please. Tagline: In 1996, electric cars began to appear on roads all over California. They were quiet and fast, produced no exhaust and ran without gasoline...........Ten years later, these cars were destroyed. Plot Outline A documentary that investigates the birth and death of the electric car, as well as the role of renewable energy and sustainable living in the future. Plot Synopsis: With gasoline prices approaching $4/gallon, fossil fuel shortages, unrest in oil producing regions around the globe and mainstream consumer adoption and adoption of the hybrid electric car (more than 140,000 Prius' sold this year), this story couldn't be more relevant or important. The foremost goal in making this movie is to educate and enlighten audiences with the story of this car, its place in history and in the larger story of our car culture and how it enables our continuing addiction to foreign oil. 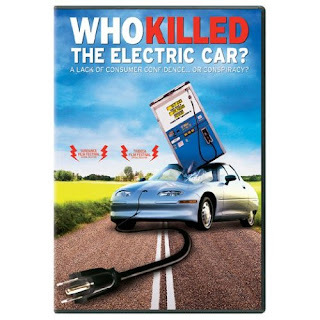 This is an important film with an important message that not only calls to task the officials who squelched the Zero Emission Vehicle mandate, but all of the other accomplices, government, the car companies, Big Oil, even Eco-darling Hydrogen as well as consumers, who turned their backs on the car and embrace embracing instead the SUV. Our documentary investigates the death and resurrection of the electric car, as well as the role of renewable energy and sustainable living in our country's future; issues which affect everyone from progressive liberals to the neo-conservative right. Awards: nominated by the Writers Guild of America Documentary Screenplay Award 2007. "Fast and furious, Who Killed the Electric Car, is the sad tale of yet one more attempt by a heroic group of civic minded souls to save the browning, warming planet." -New York Times. Iraq 4th Anniversary Protest: I35 Overpass. The Friends of Peace with help from Dallas and Austin activists performed a live freeway blog at the I35 overpass near 7th street starting 5pm, March 20th. With rush hour traffic, we reached an estimated 21,600 motorists! The response was overwhelmingly positive. We attracted 2 visits from the police, with the usual attempts to intimidate our expression of 1st amendment rights. We also attracted a small group of counterprotestors who were good natured, but unfortunately their signs were not legible at freeway level. So as this series of local protests on the 4th anniversary ends, we look at congressional action. The House has just passed a supplemental appropriations bill for the occupation which includes a deadline of troop withdrawal as late as August 2008. Of course the bill is a huge disappointment and includes many loopholes Bush would no doubt utilize. Maybe it is better than nothing. But I believe the peace movement should keep the pressure on the government to end the war, and bring home all troops by the end of 2007. The movement has made a huge difference over the last several years in helping to change the direction of the country. But much remains to be done, and civil disobedience remains "on the table." Iraq 4th Anniversary Protest: Waco Intersection. Friends of Peace with help from peacemongers from Austin and Dallas staged a protest at the intersection of Valley Mills Drive and Waco Drive, Sunday, March 18th, starting at 1:30p.m. The reception by motorists was overwhelmingly positive. A single counterprotestor appeared at the opposite corner; we engaged her in a respectful debate. The event helped bring the anniversary of the illegal occupation to the attention of Waco. Otherwise, it would have been scarcely noticed. Media coverage was excellent: 2 TV stations and a nice report in the Waco Tribune-Herald. Thanks to all 13 activists who gave of their valuable time to continue the struggle. Iraq 4th Anniversary Protest: Austin. Saturday March 17, 2007, thousands of protesters marched from the Texas Capitol to City Hall. Floats, banners, and signs filled the streets. At City Hall speakers included Rep. Lloyd Doggett from Austin. Bands performed in this "Million Musicians for Peace" protest. A solid and forceful statement was made against the continued illegal occupation of Iraq. Thanks to all from the Crawford Peace House and the Waco Friends of Peace who supported this vital action. We have many activist friends in Austin and Dallas and wish to be a part of this effort. Kay is creating a Crawford Peace House float which is a miniature version of the real Peace House. The rally and march start at noon at the State Capitol, and the march proceeds to City Hall. A concert is scheduled from 1:30-3:30p.m. For details: www.instrumentsforpeace.org The official name of the event is Million Musicians March for Peace. The Friends of Peace will stage a local protest beginning at 2:00p.m. at the corner of Valley Mills Drive and Waco Drive, the corner nearest Jason's Deli. 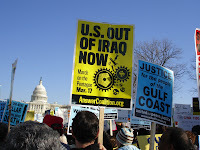 A local presence here is crucial since a large segment of the Waco population still supports the illegal Iraq occupation, despite the national rejection of the war. Depending on numbers, we may also consider our live freeway blog at the overpass of I35 near 7th.. TORTURE IS NOT A FAMILY VALUE. All peacemongers welcome; your help is greatly appreciated. If we don't speak out, we are complicit. We have large banners; bring your own signs also. (No attachment of signs in the overpass please!). Hopefully our efforts with Rep. Edwards have helped persuade him. He has been active in a House Appropriations committee to approve a bill with a deadline in Sept. 2008 for removal of all troops. The bill provides loopholes for Bush however. Of course, such a bill is far from what we want--that is, to cut off funding for continuation of the war and an orderly withdrawal to start immediately. And even if the Congress passes a bill with withdrawal deadlines, it is likely to be vetoed by Bush. At least these are small steps in the right direction. The history of Vietnam reveals the Congressional action was a slow, incremental process to end the war. I personally feel we should continue to work with Congress, but demand an immediate withdrawal. I have called Rep. Edward's office, thanking him for his steps so far, but emphasizing our demands as well. I have found a toll free number to reach the Congress: 1-888-851-1879. I suggest we keep up the pressure.